Another alarming event of the anti-Greek Hysteria and Fanaticism prevailing currently in FYROM took place. A group of Greek tourists who were at that time in the centre of the city of Ohrid, were attacked by a group numbering about 20 persons, mainly of young ages. According to E-Tipos, this group of Nationalists initially wrote with red paint Anti-Greek mottos on the Greek Bus which was at the time empty. The local media reported the mottos were “Macedonia”, “United Macedonia” and “Alexander the Great”. Mr Koumoutsakos lastly called upon the officials of the neighbouring country to “protect the Greek visitors but also to arrest and punish those responsible for these horrific activities”. Not surprisingly, it appears FYROM is nothing near to being safe for any Greek anymore!! 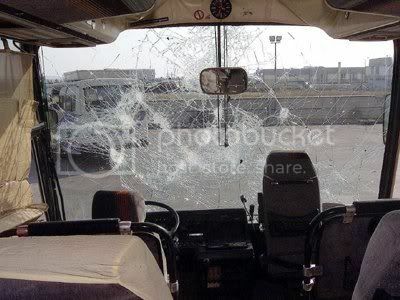 *Update* A revealing foto of the rage from the group of FYROM’s Nationalists who attacked the Greek Bus. Reeker warns FYROM : "No Name Solution, No Accession to NATO and EU"